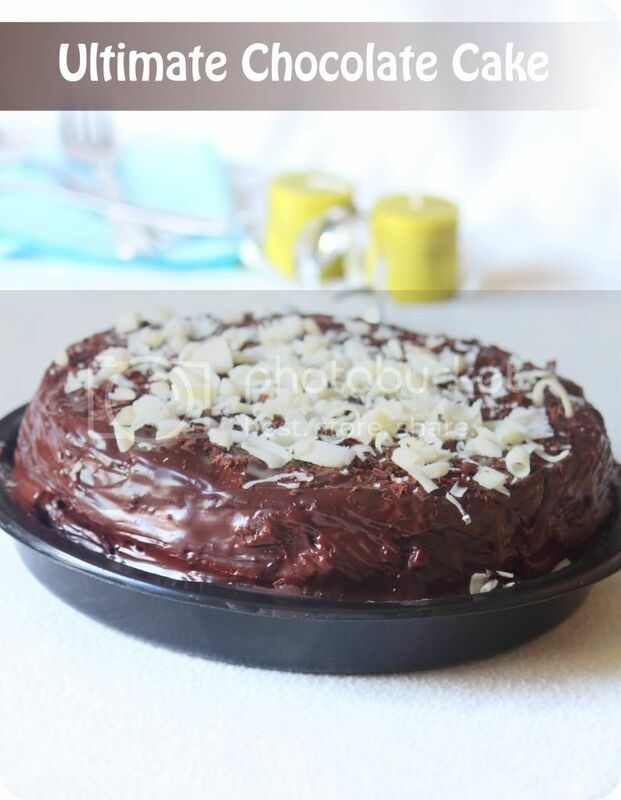 Just as the name.. An ultimate chocolate cake with just chocolate n chocolate.. For chocoholics.. this is bingo!! Kids came up for 2nd servings and most of them relished it to the max. My best critic Mr SK felt there wasnt sufficient frosting between the layers and hence cudnt rate it the best cake to his standards. Probaby I had to spread more bits between the layer and should have allowed to cool down before sandwitching. Whereever there were extra frosting bits , Mr SK loved it.. and said we could have more of them.. Loosely adapted this recipe from here . Altering wee bits to suit my available ingredients. This measurement yields 1 layer cake and 4 muffins. Preheat the oven to 180C. Line 2 21cms sandwitch tins with butter paper. Break the chocolate into small pieces and tip it in into a microwave safe bowl .Drop in the butter, coffee granules and about 125 ml water . Melt them all in microwave for roughly 5 minutes stirring in between. Combine all the dry ingredients in a large mixing bowl. Beat the eggs in a bowl and tip the stirred yogurt + 1 tblspn of water. Slowly incorporate both the wet mixtures – chocolate mix and the egg mix into the dry ingredients and whisk until everything is well blended .A smooth – running consistency should be achieved. Pour them into both the lines tins until 3/4th and bake for about 1 hour – 1.15 hour. Make sure to give a dip in the centre inorder to avoid any bump forming in the centre. Check with a skewer after 30 minutes and there after every 15 minutes to check if its done. If you push a skewer in the centre it should come out clean and the top should feel firm (don’t worry if it cracks a bit). Allow it to cool in the tin and then carefully turn onto the wire rack and cool completely. Lets prepare the Ganache frosting inbetween the waiting time.Chop the chocolate into small pieces along with the hershey’s chocolate syrup and tip into a bowl. Pour the cream into a pan, add the sugar, and heat until it is about to boil. Take off the heat and pour it over the chocolate mixture. Stir until the chocolate has melted and the mixture is smooth. Once the cake cools down completely , place the upside down cake onto the cake plate . Carefully & generously spread the frosting over the first cake .Allow it to settle before you sandwitch the second layer. I was quite in a hurry and did it immediately.. This did reflect in the taste with the frosting reduced between the layers. Sandwitch the second cake with the frosting in between.Pour the rest of the ganche over the cake letting it fall down the sides and smoothing to cover with a knife. Decorate with white chocolate curls. Sending this delectable cake to Champa’s Bake Off event. Then, this is the cake for me, a chocoholic! Heyy priya.. thanks for ur quicky n lovely comment..hope ur freaking out in the weekend..
its that time of the year again to bake bake and just bake. and this should be in the list of all chocoholics…looks sinfully chocolaty. I'm going gaga over your chocolate cake. I just love Lindt. Its one of my most favorite chocolates. hi Sandhya thecake is eye catching and think grab it just now. Looks so so so yummy 🙂 I am drooling right now. Love the chocolaty look of this irresistible cake. Like the picture with fork in it. 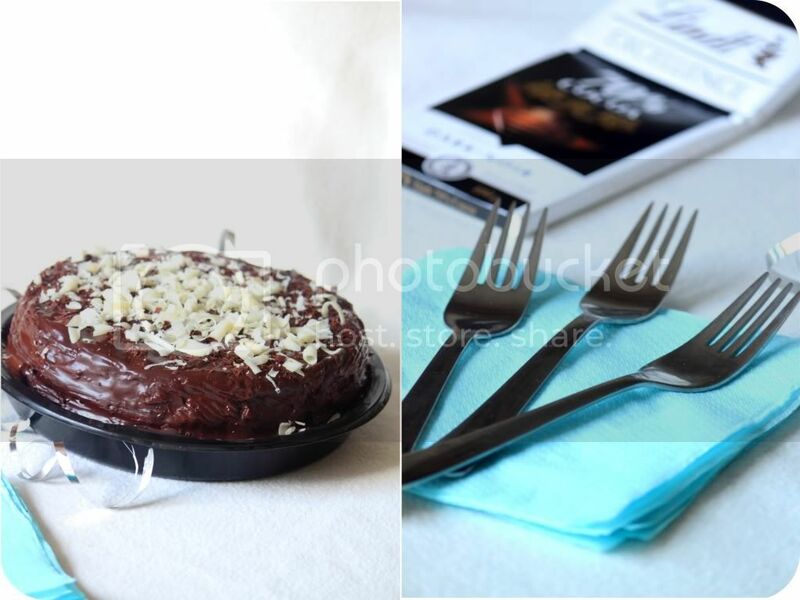 Its an ultimate recipe indeed Sandy, Such nice pictures and a yummmy cake….. Very tempting cake, looks absolutely marvellous Sandhya..
Looks good. Thanks for the entry. Thanks for stopping by in my blog Sandhya! 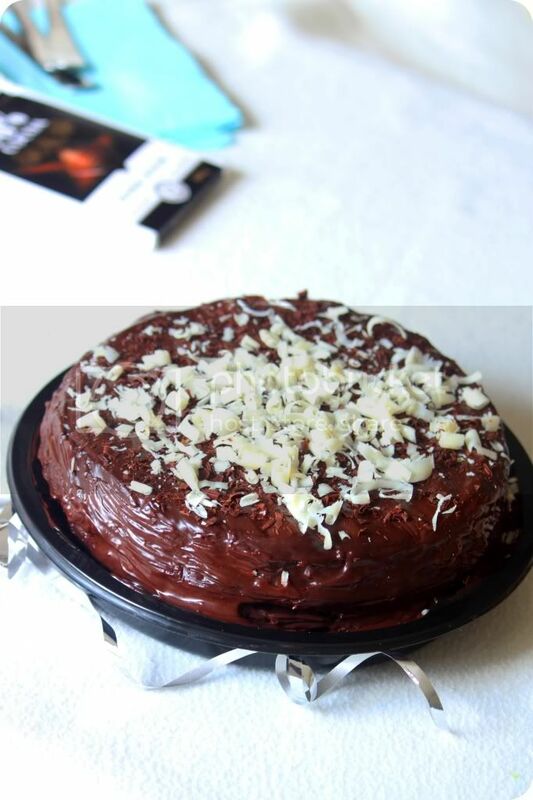 The chocolate cake looks absolutely delicious…a delight for any chocolate lover. The chocolate cake is ultimately delicious and choco-ey!